The Albion Hotel is perfect for your next function, we specialise in catering for Birthdays, Engagements, Christmas Parties, or corporate meeting spaces that will be sure to impress your work colleagues. We are committed to providing excellent service to ensure that your function is a memorable and successful occasion. The Wine Room is an intimate sophisticated room, lit by a large elegant chandelier with an area of wines displayed to the ceiling. We have two adjoining rooms, just off from the main bar, both of which you may use for your booking. The Lounge Bar is a relaxed semi private area lit by elegant shaded lamps and is centrally located off the main bar. Suitable for a variety of intimate events such as birthdays, engagement, wakes, and corporate drinks. The Lounge bar area has a private Smoking area off it and has the ability to show a photo slide show via the plasma TV. The Restaurant Courtyard is set in a tropical garden scene, with beautifully sculptured waterfall features under a large canopy. 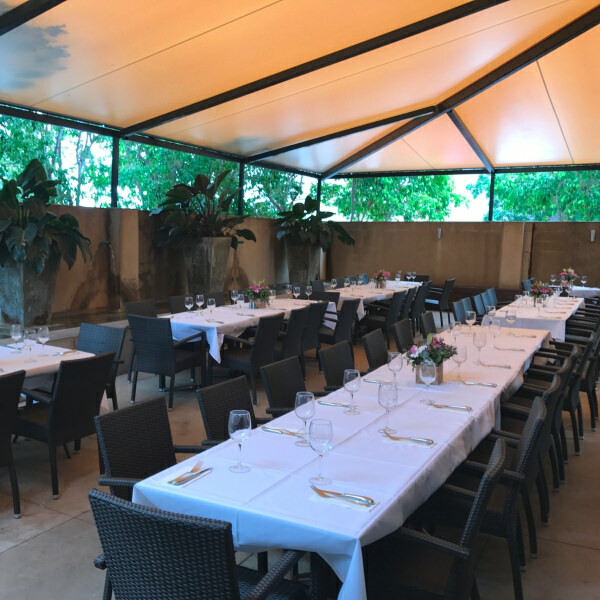 On a balmy night this area is perfect for your larger functions and events however it can also be sectioned off and transformed into the perfect private function area for more intimate functions.